Heightened communication, standards, disaster recovery and virtualization are just a few of the areas IT managers are focused on as they chart their courses for the coming months. Purse strings are still tight, so products and services with big price tags are out. Instead, the themes in 2006 will be about increasing efficiency, tightening security and enhancing communication. Security is a top issue for most IT managers, with some wanting a heightened focus on cybercrime and others bringing in open source tools to augment proprietary security approaches. Others are looking for devices that put security power into the guts of LAN switches to make security deployments easier. Jeff Crawford, manager of networking and security for public schools in East Grand Rapids, Mich., says vendors that offer multiple, single-purpose hardware devices for network services — whether it’s security, telephony or management — should make the products they offer look more like a Swiss Army knife. He has tested new gear that consolidates WAN routing, firewall, intrusion prevention and intrusion detection features into a single box — 3Com’s X505 network devices. Crawford says the Swiss Army knife approach undoubtedly will save money. He estimates he can eliminate clusters of gear that cost about US$5,000 with such combination equipment. With more business being done electronically, the need to share information and services is on the rise. That kind of collaboration requires standards. Craig Paul, systems software analyst in the applications technology group at the Kansas University Computer Center in Lawrence, says one of his big wishes for 2006 is to get local, county, state and national disease reporting databases linked and integrated into a disease screening and reporting system, which will require a standard way of inputting and sharing data. With the Internet keeping business running around the clock, enterprises are under growing pressure to keep operations active 24×7. Boscov’s Department Stores in Reading, Pa., recently moved to a new data centre. Joe Poole, manager of technical support, says he hopes to use the “perfectly functional computer room” that the move left behind to enhance the company’s disaster recovery plan in 2006. Server virtualization continues to make headway, and analysts say it should really take off this year, especially as IT managers focus on consolidating hardware and boosting efficiencies. It can be difficult for departments to express what they’re looking for in terms of IT support, he says, particularly because people easily become intimidated when talking about technology. “It’s an area where a lot of fear from other departments comes about. People don’t want to seem silly or uninformed,” he says. Bill Homa, senior vice-president and CIO of Hannaford supermarkets in Scarborough, Maine, has spent the past several years adding automation and virtualization technologies to his data centre operations. One of the drivers for the work was server consolidation, because Hannaford was seeing just 10 per cent utilization on Intel servers. Now that data centre operations are more cost effective, the next step is to look at the hardware in retail locations. “We still have two servers in each store. Our goal is to get down to one and then to no servers needed in stores,” Homa explains. Homa plans to reach this goal in 2006 by using VoIP. “For us, leveraging voice over IP is going to be big. VoIP is still relatively untouched as an application, not as a technology. Most people with VoIP just do voice, but there is the capability to have a telephone be a terminal, especially for industries with many branch locations,” Homa says. What Rich Cummins, manager of network services with Community Medical Centers in Fresno, Calif., wants in 2006 is five per cent of his budget back. The healthcare company, which manages hospitals, clinics and extended care facilities throughout central California with 6,200 employees, cut back on its IT budget for 2006, which means that a number of important projects will be put off this year. Cummins has a long list of projects he would do if he could get those dollars back. First, he would hammer out an overall security architecture for his network. The company has a number of point security solutions in place, but Cummins wants to “take a step back and look at the entire enterprise,” he says. Next he would continue down the path of server and storage virtualization that the company has started on. He would also upgrade his core network infrastructure of Cisco switches and routers, and evaluate the company’s data management strategy, particularly its disaster recovery and business continuity plans. “We’re growing our data at a rate of 200 per cent a year,” he says. As for management, Cummins says he would look at enterprise monitoring tools that would allow his staff to be more proactive regarding issues with the network. Cummins says he also would fill out his staff, adding a project manager and a network engineer, positions that are currently on hold. Joe Poole, manager of technical support at Boscov’s Department Stores in Reading, Pa., says a beefed-up staff is on his wish list, as well. Government regulations such as the Sarbanes Oxley Act are putting pressure on businesses to better manage and secure digital data. Enterprise users just want a break. “Given all the mandated activities of the past few years and all the new technologies that we’ve had to absorb, the Sarbanes Oxley compliance, Health Insurance Portability and Accountability Act, all those things and the new technologies we’ve put in place to deal with those regulations…. 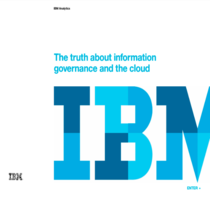 Give us a breather,” says Robert Rosen, president of IBM’s user-group Share. “It’s one of those things that gets a nervous chuckle,” Rosen says. “You think it’s funny, but deep down you know it’s absolutely true. Service-oriented architecture (SOA) continues to be the big buzz, as enterprise users strive to integrate Web-based applications. Al Tobey, software infrastructure development architect at Priority Health in Grand Rapids, Mich., says he wants that integration to be easier. The U.S. Food and Drug Administration recently migrated 1,700 employees to VoIP services as part of a move to a new campus outside Washington, D.C. Eventually 7,700 employees will work from the new campus using a converged IP backbone, so securing access to the network is critical, says Glenn Rogers, deputy CIO of the FDA. At Saugus Union School District, the focus will continue this year on empowering its schools by giving teachers access to online content and blogs. Security is on tap for Mike Nix, director of communications technology for IT Services at the Kansas University Hospital Authority in Kansas City. Nix’s network supports a teaching hospital with 11,000 managed nodes and 15 WAN sites. His most important technology plans in 2006 involve implementing 802.1x — both wired and wireless — to enable role-based network access and improve security via Cisco’s Network Access Control (NAC) strategy. Nix also plans to increase the company’s internal intrusion detection systems by augmenting with the freeware IDS tool Snort, as well as utilize his organization’s embedded infrastructure of McAfee Antivirus and ePolicy Orchestrator products, along with Cisco’s Trust Agent. The goal is to make improved security a reality for both wired and wireless users. He also plans to implement private virtual LANs to segregate users from each other, as well as mitigate or eliminate the spread of viruses. “I have a laundry list of projects, but I view these as the most critical areas for improving our service to customers,” Nix says. Jeff Allred, manager of network services at the Duke University Cancer Center in Durham, N.C., says he’s tired of patching operating systems. “If I had one thing I would like to see in the coming year, it is for someone — not necessarily Microsoft but they come to mind for sure — to release an operating system where all their time and money was spent perfecting the operating system, as opposed to worrying about new features, new bells and whistles,” he says.